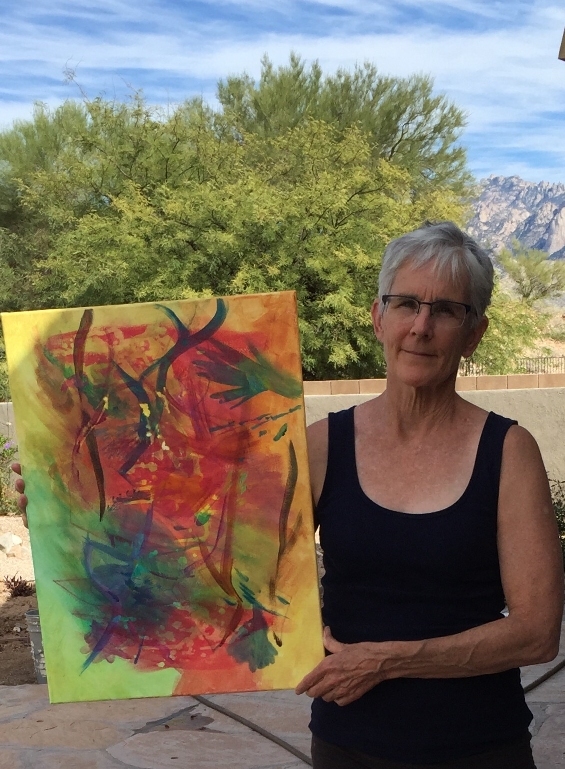 Marva came up from Tucson for my Luscious Abstractions class last April. She enjoyed the critique so much that afterwards she asked if I would do something similar for her art group. 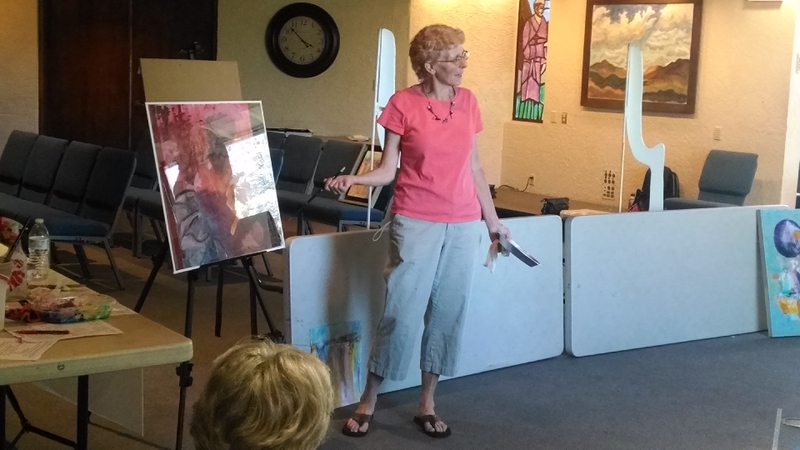 Marva is the program coordinator for the Contemporary Artists of Southern Arizona (CASA). So we came up with a plan, and in October I drove to Tucson with slides, demo, and critique supplies in hand. 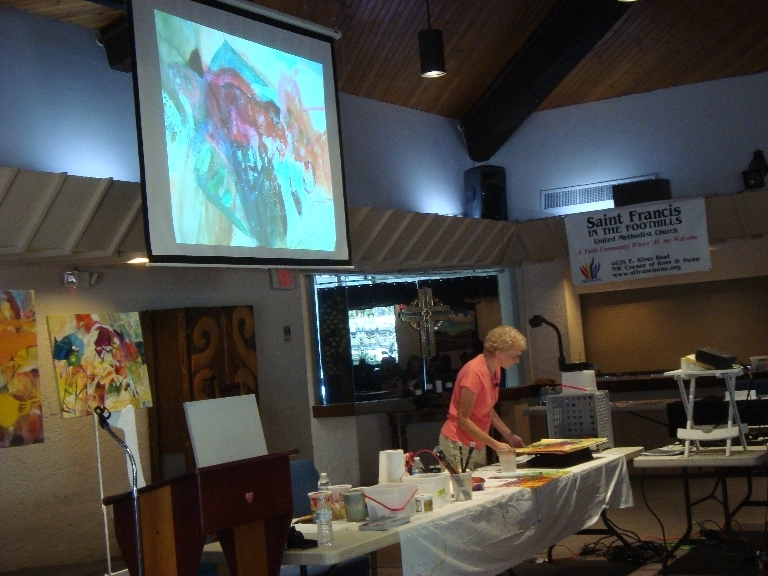 The program included a pouring demo, but on seeing a CASA show the evening before, I realized that the canvas I had brought was not suitable. The group would benefit more if I used a regular store-bought canvas instead of my hand-stretched one where the paint runs at a much slower speed. So Marva offered a canvas of her own. 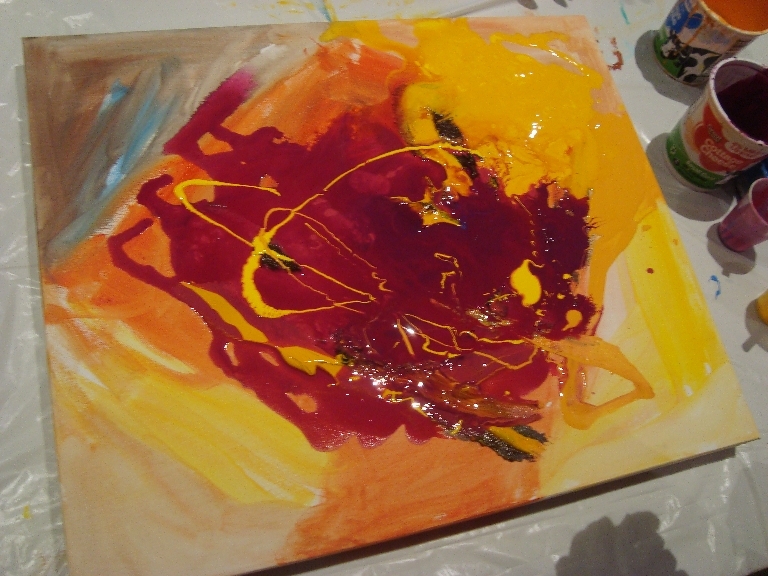 This was the initial pour during the demo. Look at that yummy yellow! Pours are luscious when wet. I added a second pour when I got back to my studio. The painting needed more action in the corners, and I wanted a soft, neutral gray to offset the active red. 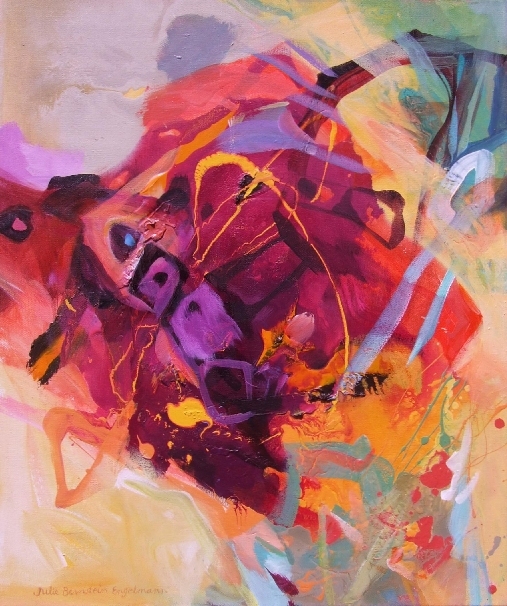 The finished painting: “Marva’s Amazing Heart,” by Julie Bernstein Engelmann, Latex and acrylic on canvas, 24″H x 20″W. I turned the canvas vertically and completed it in acrylic. First, I seated the diamond shape on the beautiful base. Then, I integrated the corners by modifying the colors and activity. Finally, the center suggested a “story,” which also served to give it definition. 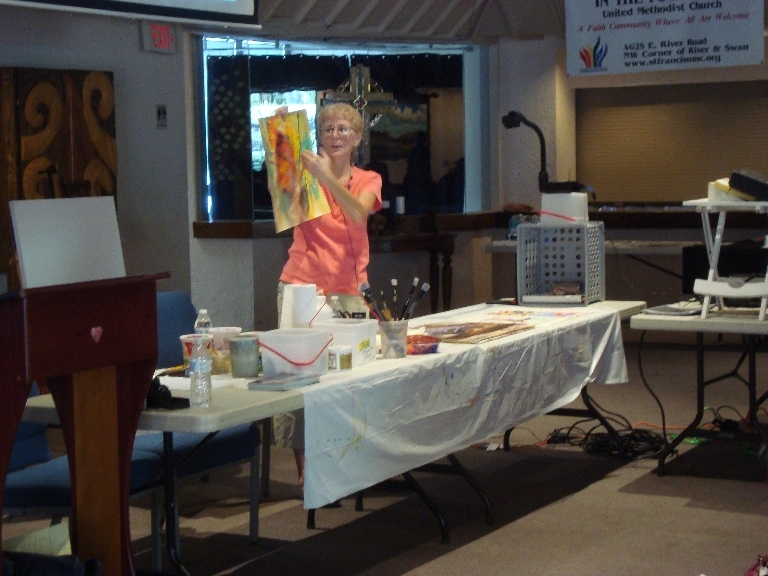 A group of artists stayed for the afternoon Mini-workshop, “Revitalize your abandoned artwork! 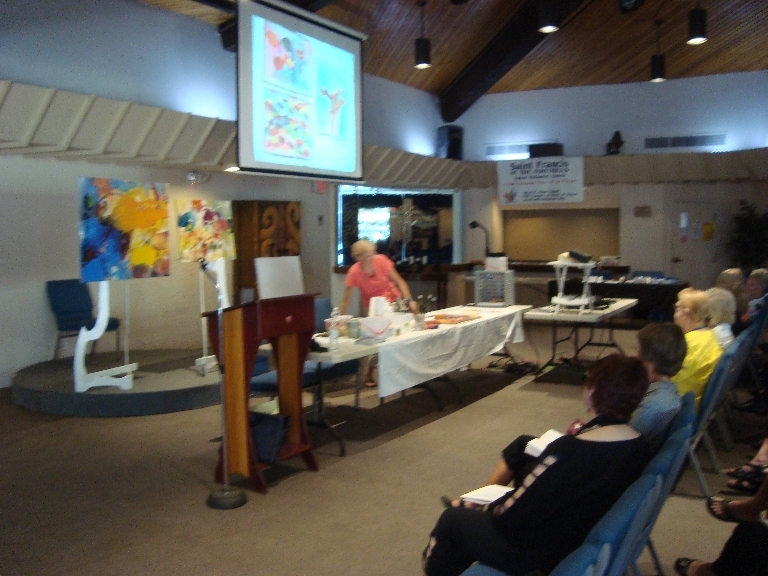 In-process critique with Julie Bernstein Engelmann.” Each attendee brought a piece she was stuck on or hadn’t finished in a previous workshop. 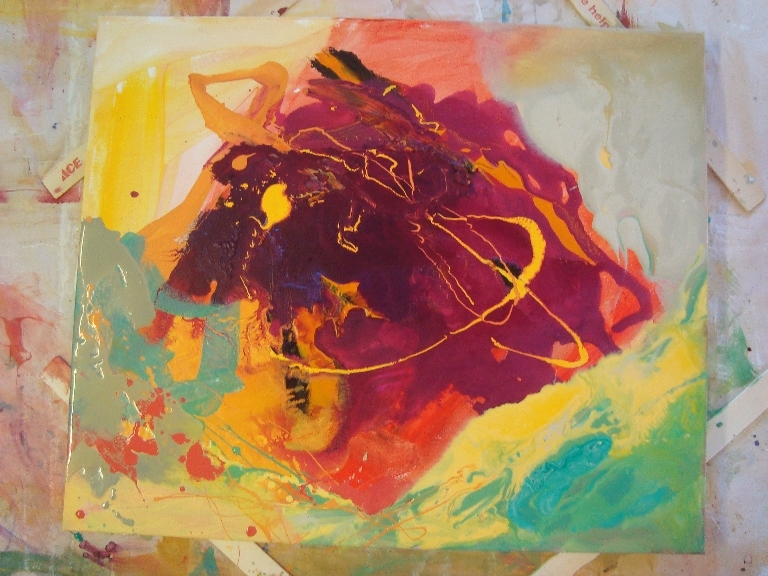 Using acrylic on glass over the painting, I demonstrated the thought process for enhancing the magic you do see in the paint, rather than letting frustration blind you to it. The next day, heading home my daughter and I stopped at the studio of a friend who wanted a private art class. It was a special and sacred time. My favorite kind of trip: as an art emissary! 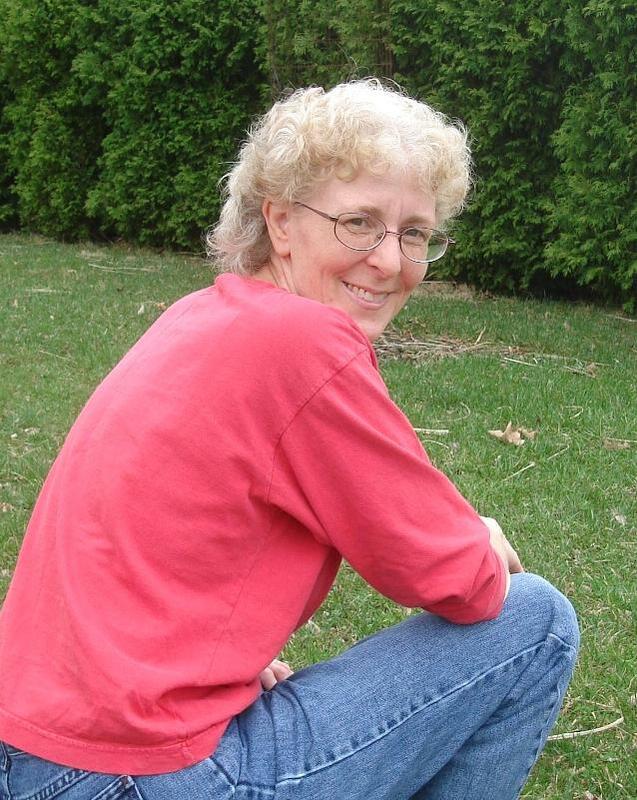 This entry was posted in Events, In the studio, Julie Bernstein Engelmann News, Muse, Presentations, Process, Teaching, Trips, Workshops on October 30, 2016 by Julie.